Check out the new Shazam! 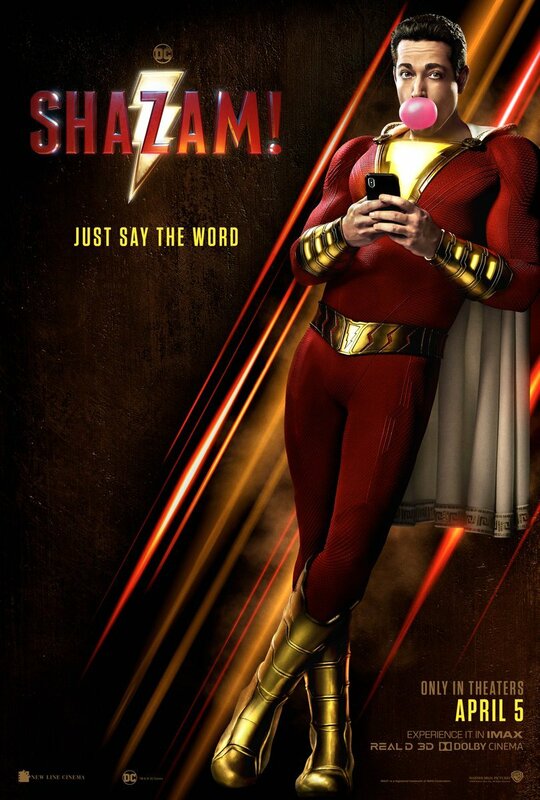 poster featuring Zachary Levi as the titular character which offers to "Just say the word." The word, of course, being "Shazam!" that transforms the young Billy Batson into DC's Captain Marvel, aka Shazam. Shazam! has an April 5, 2019 release starring Zachary Levi as the titular DC Super Hero; Asher Angel as Billy Batson; Mark Strong in the role of Super-Villain Dr. Thaddeus Sivana; Jack Dylan Grazer as Billy’s best friend and ultimate superhero enthusiast, Freddy, part of the foster family that includes Mary, played by Grace Fulton; Darla, played by Faithe Herman; Eugene, played by Ian Chen, and Pedro, played by Jovan Armand. Cooper Andrews and Marta Milans play foster parents Victor and Rosa Vasquez, with Djimon Hounsou as the Wizard.